Sleep is for the weak: Eeek spiders! There's nothing creepier than giant black spiders this time of year and I wanted to make our entry extra spooky for the impending trick-or-treaters. I could go with the whole fake spiderweb thing but that's not very creative. Thanks to Pinterest, I have adorned our door with these frightening creatures. I had originally thought of getting spider rings and cutting the ring part off but I couldn't find a pack that was just plain black, they all were black, purple, and orange so it seemed like a waste of money. Then there was the issue of attaching them to the door, I could use magnets but then I had the hardest time trying to find THOSE. I had decided that hot glue would come off easily enough and wouldn't mess up the door so I'd just do that. I was so surprised as I was cleaning up my craft room to stumble upon these business card magnets. 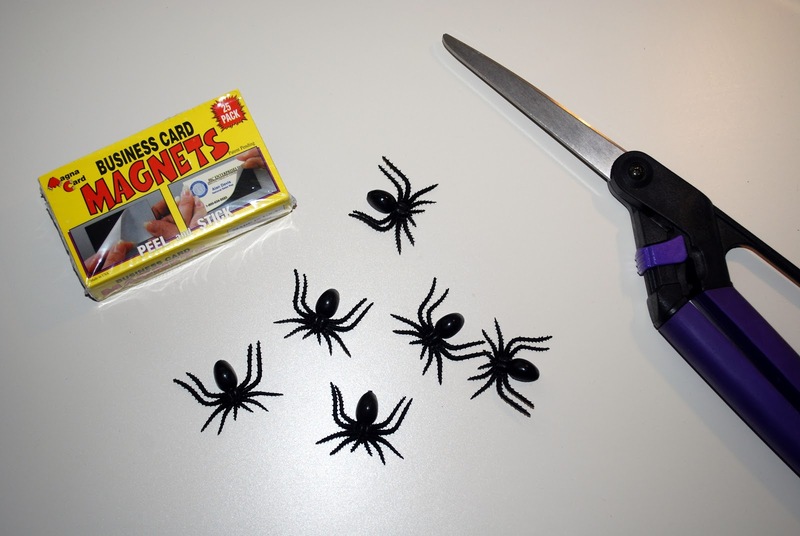 I knew that was the best way to go, I could just cut them into small pieces and affix them to the back of my spiders. 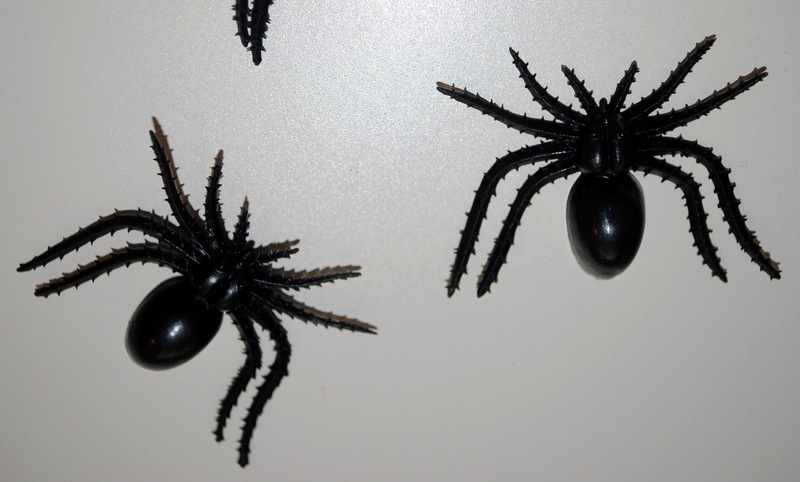 I was also please when I found these plain spiders at Target, they came in a pack of 75. The sticky back of the magnets wasn't strong enough to hold them to the spiders so I got out my trusty hot glue gun and attached them with a little dollop on each spider. I think the end result is better than I thought, I like how it looks like they are all making their way into the house. And since they're magnets, it'll be easy to take them down and reuse the next year. It was so creepy my sister wouldn't even knock on my door when she came over to craft. Score one for me!